Neil Lennon has said he regrets the way he reacted to referee Kevin Clancy during Saturday’s 2-2 draw with Kilmarnock at Rugby Park. The Hibs boss was furious at Clancy awarding the home side a penalty after Alan Power’s shot struck Ryan Porteous on the arm, and angrily reacted to the whistler’s decision to send him to the stands. TV footage showed Lennon sarcastically applauding Clancy before launching a verbal tirade at the official. After the match, an incensed Lennon branded Clancy ‘amateur’ and accused him of using guesswork to make the penalty decision. 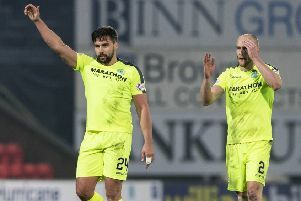 Lennon also claimed that Clancy had “made it personal” after the Northern Irishman had criticised the same official for failing to award Hibs a penalty in a home game with Rangers in December. Earlier today, Lennon was hit with a Scottish FA notice of complaint accusing him of two breaches of discipline. Speaking at a media conference ahead of Wednesday’s home match against Hamilton Academical, Lennon said: “I didn’t agree with the penalty decision and I didn’t agree to me being sent off. “However, my reaction to the sending-off was regrettable. But it was adding insult to injury. “I see other managers behave a lot worse than my behaviour was on Saturday. “Even when you see the referee come over to talk, I disputed the decision at the time, like any other manager would, there was no conversation between me and the referee and I was sent to the stand. Lennon will likely face a lengthy touchline ban but, with the principal hearing of his case taking place on Thursday, March 15, he will be in the dugout for the matches against Hamilton and Hearts at Easter Road.